Currently working on a ten-week project that involves the branding of a whole museum exhibit. 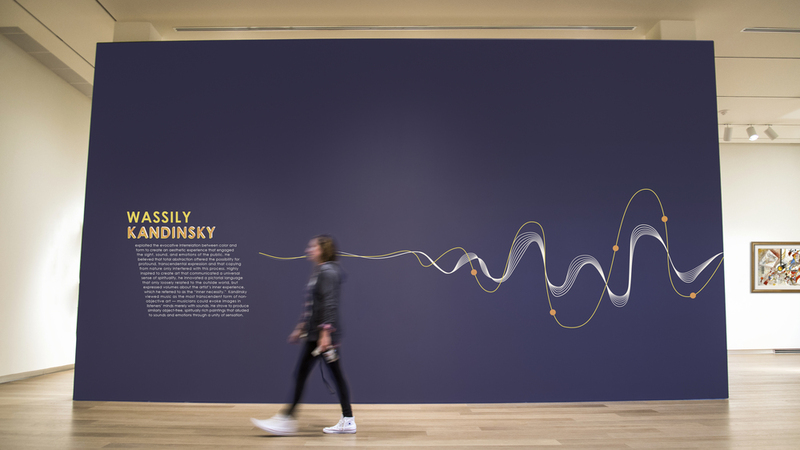 This one highlights Wassily Kandinsky as a synaesthetic artist who heard music when he saw colors, and he believed that the symphonic artwork he created reached a deep inner part of the soul that transcended into spirituality. His work was a very important part of the prehistory of motion graphics as a dual-sensory experience. I've branded the exhibit as SIGHT+SOUND=SOUL with visuals that represent how 1+1=3, since his artwork triggered music which then reached an even higher level of sensation from the combination of the two. Next I'll be working on programs and packaging, so stay tuned!